The muted hues of coastal terrain confronted the deep blue of the Pacific Ocean as I made my way up California’s fabled Highway 1 from Los Angeles to Santa Barbara. Despite passing cars, the therapeutic sound of crashing waves was all I could hear as I approached the town of Goleta, home to Bacara Resort & Spa. 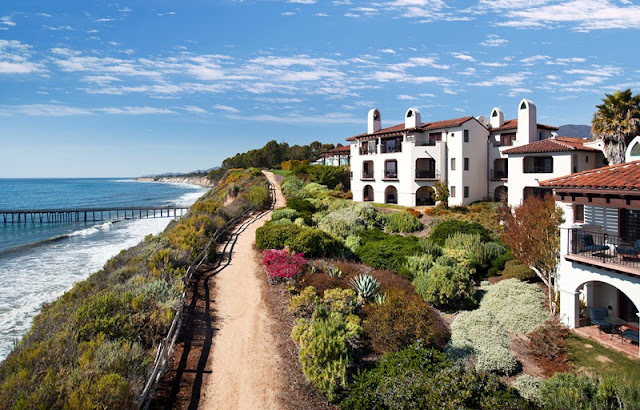 Nestled between the Santa Ynez Mountains & the vast Pacific, Bacara sits directly on a two-mile stretch of natural coastline, and is the result of one man’s quest to build the perfect resort – I would say he succeeded. Cobblestone pathways bend around the resort’s lush landscape and Italian-style fountains complement Spanish-colonial architecture. Two saline swimming pools surrounded by mile-high palm trees and plush cabanas are at the center of the resort, whose grounds emanate nature and calm. The Spa at Bacara, long regarded as one of the world’s best, takes the resort’s tranquil vibe a step further. An outdoor adults-only swimming pool, 36 treatment rooms, 4 private suites, an outdoor massage terrace and private rooftop areas for mud-based treatments, scrubs, and newly introduced European sunbathing, puts this spa in the company of few others. One of over 60 treatments on the menu, the Signature SeaCreation Facial utilizes microorganism extracts from the depths of the sea to produce impressive anti-aging results, and proceeds benefit the Gaviota Coast Conservancy to help protect the resort’s beautiful coastline. Constantly striving to bring meaningful experiences to guests, the resort also offers outdoor yoga classes atop a nearby bluff and guided nature walks along coastal trails. As for stimulating the palate, The Spa Café offers cuisine designed to detoxify and refresh, like customizable smoothies, savory salads and small plates with an Asian twist. For a more formal dining experience, Miro, named after the Spanish artist, boasts New American cuisine in an art-inspired indoor setting, or outdoors on the oceanfront terrace. Bacara Bar is low-key with a lounge atmosphere where handcrafted cocktails and small bites are served on the Ocean Terrace, complete with fire-pits and sweeping views of the resort and the sea beyond. The possibilities at Bacara Resort & Spa seem endless. I could easily spend a week there and never leave resort grounds, immersing in its calm serenity and gazing at the horizon.